A History of the RV Industry In America: The Dumb Things Sold Just Like That! From chauffer-driven land yachts to today���s sophisticated, self-contained motorhomes, the recreational vehicle industry has continually evolved to meet the demands of its ever-growing body of enthusiasts. What started out as simply a way to store and transport more camping equipment is today, for many, a fulltime RVing lifestyle. 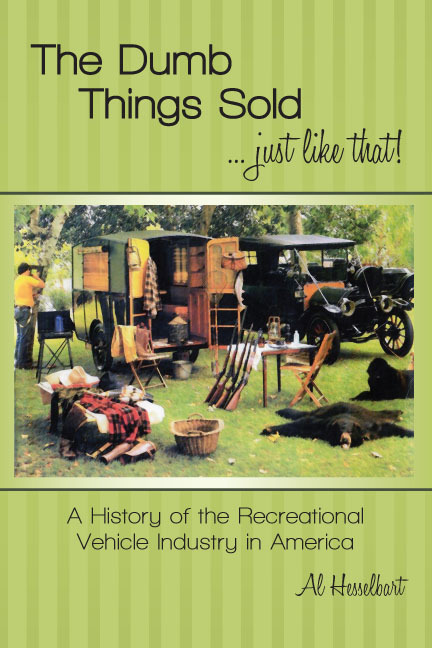 In his new book, ���The Dumb Things Sold Just Like That, A History of the RV Industry in America���, author and historian Al Hesselbart traces the RV industry���s history through the lives and accomplishments of its early pioneers. In addition to an overall history of the industry, the book features biographies of eighteen of its leaders whose accomplishments still have impact today. Bargman, Callendar, Coleman, Crist, Schult and Sherman are just a few of those included in Hesselbart���s book. Highlighting the text are scores of photos of vintage recreational vehicles. Many of these came from the archives of the RV/MH Heritage Foundation���s library, where Hesselbart has been archivist and historian since 1994. The book is the first in a series of historical titles that feature collections held in the Heritage Foundation���s library. Hesselbart looks at this as an opportunity to share these artifacts with a larger audience.